The whirlwind tearing through international relations that is U.S. President Donald Trump may be forcing Angela Merkel and Vladimir Putin to come together after years of confrontation. Merkel has been Putin’s most implacable critic since he annexed Crimea in 2014, plunging relations to their worst in decades. On Saturday, however, the German chancellor will welcome the Russian president to an 18th century Baroque palace near Berlin for their first bilateral meeting in Germany in more than five years, handing Putin a major breakthrough in ending Russia’s isolation and reaffirming Merkel’s pivotal role in Europe despite election setbacks. 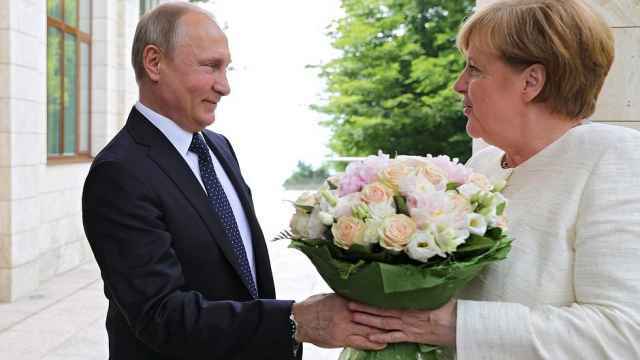 This is Putin’s highest profile bilateral trip to Germany since 2013, though he and Merkel have met at international events including last year’s Group of 20 summit in Hamburg. Merkel has visited Putin in Russia several times, most recently in May. She’s advocated engagement principally to deliver blunt messages rather than being a bridge between the European Union and Russia. While officials from both countries played down the significance of the invitation to Putin, it comes after Trump last month slammed Germany as “totally controlled by Russia” because of its dependence on Moscow for natural gas supplies. 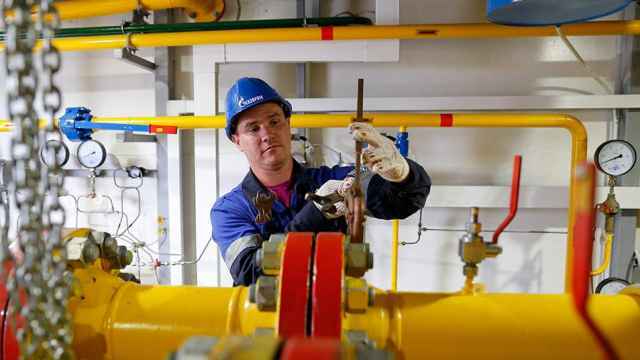 Work on a new gas pipeline linking the two countries, the Gazprom PJSC-backed Nord Stream 2, began in May amid a U.S. threat of sanctions targeting the project. Putin stressed the importance of Merkel’s support for Nord Stream 2 as evidence of her willingness to assert Europe’s independence, said three people who attended a recent meeting between the president and senior diplomats. The Kremlin views divisions between the U.S. and Europe over trade and the Iranian nuclear deal as a chance for Russia to mend relations with Germany by presenting itself as a more reliable partner in negotiations, according to other officials, who asked not be identified discussing internal matters. Amid rising U.S. pressure over the pipeline, Merkel moved to ensure Russia continues to supply gas through existing networks via Ukraine. She sent one of her closest allies, Economy Minister Peter Altmaier, to Moscow and Kiev in spring to help mediate a deal on gas between the two countries that are in conflict over Crimea and separatists in eastern Ukraine. The conflicts in Syria and Ukraine are on the agenda for the talks, officials from both countries said. 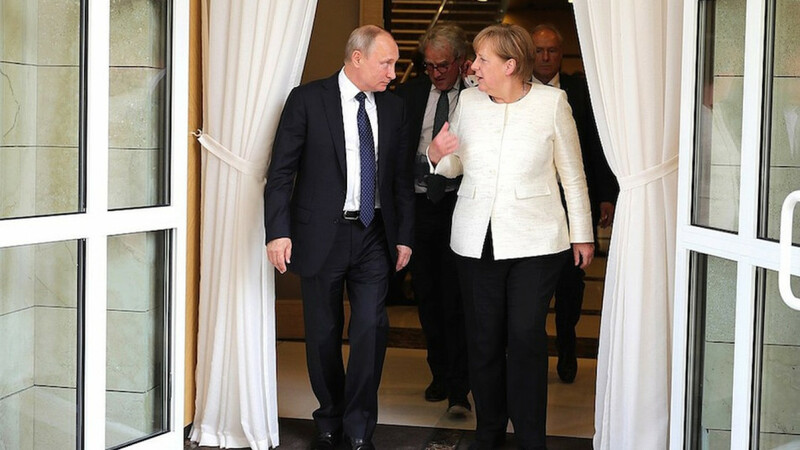 There’ll be no breakthrough over Ukraine, though “it’s advantageous for Putin to play along with Merkel because there’s no-one else in Europe to rely on,” said Andrey Kortunov, head of the Russian International Affairs Council, a research group set up by the Kremlin. Merkel’s suffering domestically after a political backlash against her 2015 decision to leave the border open and allow more than 1 million refugees, most of them Syrian, into Germany. She needs an end to the war in Syria to allow migrants to return home, while she’s also under pressure from German businesses to allow the lifting of EU sanctions on Russia over the Ukrainian crisis. Germany’s seeking a political solution on Syria that would create conditions for refugees to return, Merkel’s chief spokesman, Steffen Seibert, said Wednesday. “We’re still a long way away from that,” he said. After Putin used his military to tip the war in Syrian President Bashar al-Assad’s favor, Russia’s joined with Turkey and Iran in trying to engineer a settlement. Putin also agreed coordinated steps with Trump at their Helsinki summit last month to try to stabilize the situation. The economic crisis in Turkey may loom over Saturday’s talks. A possible Syrian government attack on rebel-held Idlib province could spark another refugee exodus, giving Turkish President Recep Tayyip Erdogan “potential if unsavory leverage” to secure western aid by deciding whether to open Turkey’s borders, according to Jacob Funk Kirkegaard, senior fellow at the Washington-based Peterson Institute for International Economics.